2.Line up 13x9" baking pan with foil. Coat it with vegetable cooking spray. 3.Mingle all the ingredients: flour, cinnamon, baking powder, baking soda, salt, nutmeg, and cloves in a bowl. 4.Beat sugar, pineapple, oil and vanilla in mixer bowl until light and smooth. Beat in dry ingredients until fully mixed. Stir in carrots. 5.Now beat egg whites in small mixer bowl to form stiff peaks; fold into carrot mixture in 2 batches with rubber spatula. 6.Pour batter into pan. Bake for 40 minutes or until toothpick inserted in center comes out clean; cool in pan or on wire rack. 7.Invert cake onto wax paper; remove pan and foil. 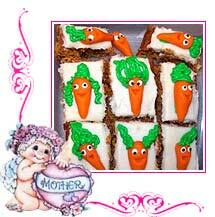 8.Your Mother's Day carrot cake is ready to be served.